Once a peaceful grove, this wilderness area was teleported from its place on the surface to a cavern deep below a mountain. The magic used to accomplish such a feat corrupted the life of the grove. Over hundreds of years, the plants took over the cavern and the wildlife thrived, including the monsters that now call it home. 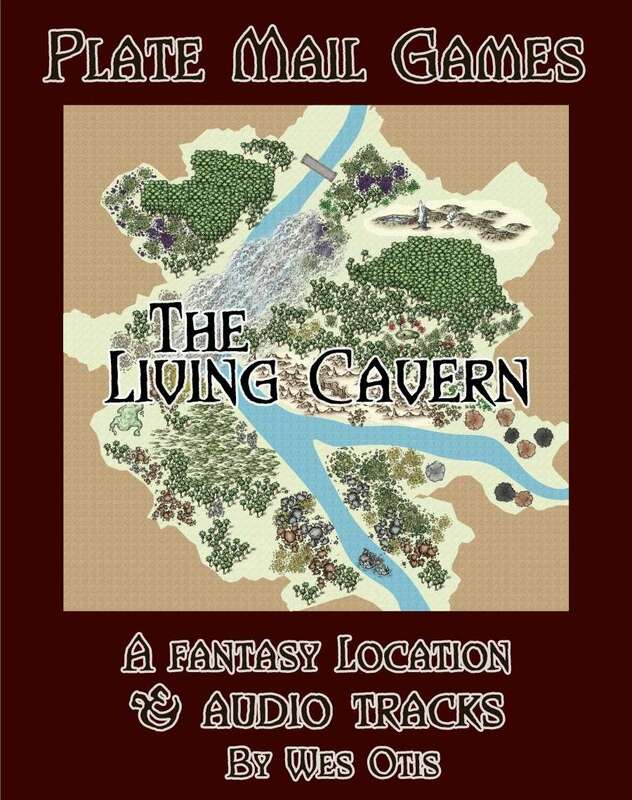 The Living Cavern is a fantasy location and audio collection that can be used with any fantasy setting. Descriptions and story ideas are provided, along with audio tracks for the different areas of the cavern. GMs can customize the cavern to their group's level of skill. It can be the location of several adventures. 4 large maps, 2 for the GM with numbering, 2 for Players without numbering. 7 fantasy background loops, each 10 minutes long, that can be used with the Living Cavern or any location. Each track comes in MP3 and FLAC files. Is it possible to get copies of the maps that do not have the numbers printed on them? Sure, give me a little bit and I'll make it happen. OK, I've added maps without numbers. Thank you for shopping with us!